flogging a 14-year-old student in her class. According to reports, the parents of one 14-year-old Okafor Chinaza, a student of starlight secondary school, Ogidi – fought and killed their daughter’s teacher for flogging her. It was gathered that the student in question was flogged by her Igbo teacher and class mistress earlier in the morning for not sweeping the class according to class roster. When the teacher walked in to teach them, she found out that the class was dirty as she questioned the student why she didn’t carry out her duty. The student allegedly responded in an insulting manner to the teacher according to fellow student’s present in the class room. As at 3:23pm same day, she came back with a lady believed to be her mother and a young man who claimed to be the uncle. According to starlight secondary school security, she refused to introduce herself properly as she forced her way into the school and went to the classroom of the girl to find out that the said teacher had gone for private school teachers meeting same day. She was directed to the Proprietress’ office when they found out she had come for her daughter’s issue with a teacher of the school named Odilinye Rita. I was in my office with one of my teachers when she came in, after her report and confirmation from the students that the teacher flogged the said Okafor Chinaza, I pleaded with the mother and uncle to allow the school dive into the issue with diplomacy as revenge won’t yield needed result. She had accepted to forget and forgive as I promised her that we will handle the case with ease. The teacher was believed to be coming back from the private teachers meeting she went to, when she met the student’s people. Upon getting close to them, the student who came with her mother and other relatives, pointed at the teacher to the mother as she rushed to hit her (the teacher) with the stick she had come with. 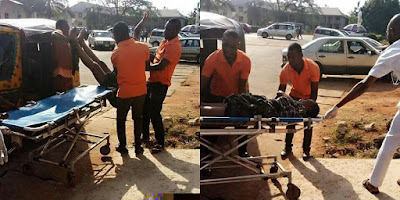 After a while, the teacher collapsed and was rushed to Iyi-Enu Hospital Ogidi where the doctor confirmed her dead moments later. Currently, the parents and the student are being detained by the police in Ogidi police station.